The Hindu Students Council (HSC), a 501c3 non-profit, has a newsletter, an Internet network, and as many as thirty campus chapters throughout the United States. The HSC is unquestionably the most extensive Hindu student organization in America. According to its mission statement, the council aims to “inspire the development of an ‘integrated personality’ based on the spiritual and cultural treasures of Hindu heritage.” The organization seeks to provide “opportunities to learn about Hindu heritage and culture” and offer community service (seva). In a more political vein, it aims “to raise awareness about social, political, and religious issues affecting Hindus.” The majority of HSC members, about 60 percent, are American-born Hindus for whom the questions of a new American Hindu identity are urgent ones. Among the activities of the Council are regular study groups on scriptures, yoga, and philosophy at such universities as the University of Pittsburgh, Michigan State University, and Northeastern University. The Council sponsors campus-wide forums, such as one at Ohio State University on “The Caste System—Is it in the Scriptures?” It also sponsors service projects, especially through its partnership with Hindu American Seva Charities (HASC), which was founded in 2009 to promote interfaith community services on campuses, with a focus on Dharmic religious groups. For many students, the HSC provides a much-needed forum for claiming and, in fact, re-creating a Hindu identity in the American context. For others, however, the HSC raises disturbing questions because of its relationship to the Vishwa Hindu Parishad, which they perceive as a Hindu nationalist organization. 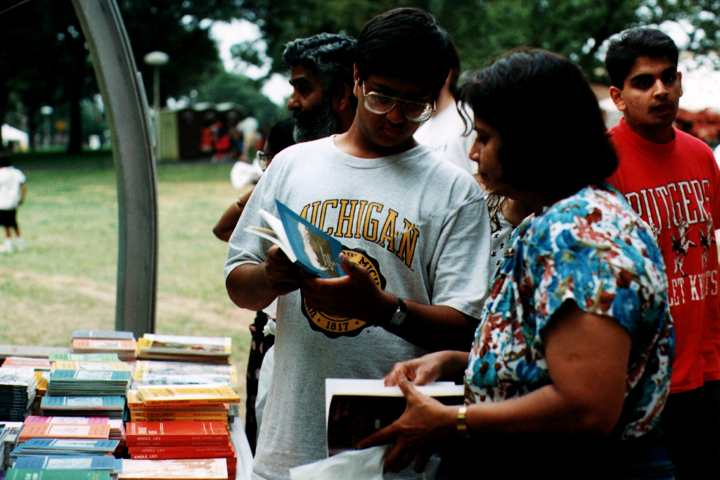 It was in the late 1980s that the first wave of American-born Hindus, the children of the first-generation immigrants, entered college. There had long been Indian or South Asian student associations on campus, but now something quite new began. Hindu student organizations began to develop alongside the Jewish Hillel and Christian fellowship groups. This new Hindu student movement was sponsored by the Vishwa Hindu Parishad (VHP) of America, known especially for its promotion of Hindu Dharma and its links with the Hindu nationalist aims in India. Some Hindu students, however, have been uneasy with the Council’s relation with the VHP. In a probing and balanced article in Little India, entitled “Hindu Revival Stirs College Campuses” and published in 1994, Dartmouth graduate Sridhar Tallapragada explores both the appeal and problematic of the HSC on campuses. He cites the Sanatana Dharma Sangha at Columbia University as an example of a Hindu student group that has adamantly refused to join the Hindu Students Council. It did not want to be associated with the VHP, especially in the aftermath of the 1992 destruction of the Babri Masjid, the mosque said to have been built on the site of Lord Rama’s birthplace in Ayodhya in India. The violent demolition of the mosque, sparking a spate of communal violence between Hindus and Muslims, was openly supported by the VHP in India. When then-President of VHP America, Dr. Mahesh Mehta, defended the demolition of the mosque in a speech at a Columbia University student event honoring the centennial of Vivekananda’s visit to America, many students walked out. They felt that this strident and dogmatic form of VHP Hinduism was not only “dangerous and scary,” but a “distortion of Swami Vivekananda’s message.” For these students, the focus of the VHP was—and is—too much on religious nationalism in India. Some student leaders of the Council, however, defended its involvement with the VHP. They insisted that VHP provided only financial support and gave the students of the HSC complete autonomy. Many of these students did share with the VHP, however, the desire to create a strong Hindu organization in America, one able to lobby for the interests of India. Also important was the ability to respond to instances of overt discrimination against the Hindu community in the United States. In the mid-1990s they cited hate crimes against Indians, such as the killing of Navroze Mody by a local gang of “Dotbusters” in New Jersey. 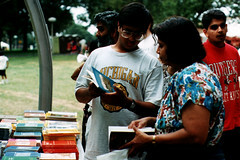 Hindus, they argue, should be able to speak on behalf of the Hindu community, both domestically and internationally, much like the Jewish community which, through established organizations and a strong voice in the American mainstream, is able to advocate on behalf of both the Jewish community in America and their spiritual homeland in Israel. But Tallapragada asks troubling questions. Should a Hindu student movement in America tie its energy to what many perceive as a right-wing Hindu organization in India? Should American Hindus really be concerned about the threat to freedom and practice of religion that seems to come from the American Christian right-wing? And even if that were a real concern, should Hindus forge an identity in America that virtually mirrors the chauvinism of right-wing Christian nationalism? The debate and dialogue has only begun—and it has begun among the students.